I keep these handy Green Bay Packers Ziplocs in my car. I fill them with trash. Orange peels. Used Kleenex. Stinky, gross stuff. I zip them tight and the stink stays in. Then, when I toss them out, that green and yellow logo shines bright in the garbage, right where it belongs. I get that if you count up their record against each other, GB is ahead 96–94–6 through November 12, 2017 (their last meeting as of this writing). That’s practically a tie, but OK. Today, it is GB. Remember, we had the class of Walter “Sweetness” Payton, and they had Charles “Too Mean” Martin. 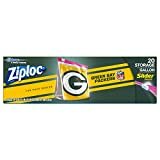 If you are a Packers fan and want to keep your delicates stored in these bags, fine. They’ll keep your rose petals, marshmallows, and cat treats as long as can be.